Michael O’Neal, life coach and host of the “Solopreneur Hour,” offers tips and steps on becoming successful at living your passion. 00:51 Michael O’Neal: You know, Beau, thank you for having me on the show. You trumped me on spankings. I didn’t have that many, I don’t think. You were worse than I was. I didn’t know that was possible. 01:02 Beau Henderson: I was just excited, but yes, that somebody else got that. They actually turned out okay, maybe, by somebody’s definition. But had that many spankings. It was almost… I just got used to it. I didn’t even fight it anymore after about half way through the year. 01:16 Michael O’Neal: Now, was that from teachers? That was capital punishment back in that day. 01:19 Beau Henderson: Yeah, exactly. Back when you could paddle. 01:22 Michael O’Neal: Back when you could paddle. The nuns, ’cause I went to a parochial school, Catholic school actually, did not… They did not whack us. Although, I did have to hold Bibles a couple of times, where you had to hold them out at your sides, kinda like you’re on the cross, you’re holding Bibles. I had to do that a couple times. And then also, my most embarrassing one was that they made me… My teacher… My Third Grade, Second or Third Grade, I was on a single story school, like a ranch kind of style, not multiple stories, and my teacher made me walk around the school three times. So that meant that I had to walk in front of everybody’s classroom, and everyone’s looking out the window at me. The entire school three times. 02:06 Beau Henderson: Were you holding the Bibles while you walked around the school? 02:08 Michael O’Neal: No, that was Saint Joan of Arc, but there was not… There were no Bibles for that one. 02:14 Beau Henderson: Well, I don’t wanna get off on a completely different show, but this is how bad it was, I learned real quick, when I got home, I would get another spanking. So First Grade, actually, is about 26 spankings. 02:25 Michael O’Neal: Do you think… Do you feel like that that, the spanking, is a lost art in 2015, and that we should do more of it? Or are you of the mind set that we have come up with better ways to discipline kids? 02:36 Beau Henderson: You know, I’m a little old school in that respect, in that I actually believe for me, I had a healthy respect of my father that that was a good thing. 02:46 Michael O’Neal: That’s right. There was a belt involved. That’s how it was for me. 02:49 Beau Henderson: That’s right. We could go on all day about how much we were beat. 02:54 Michael O’Neal: I just use a taser now, it’s more advanced. 02:58 Michael O’Neal: I have no kids that I’m aware of, so don’t take that seriously. 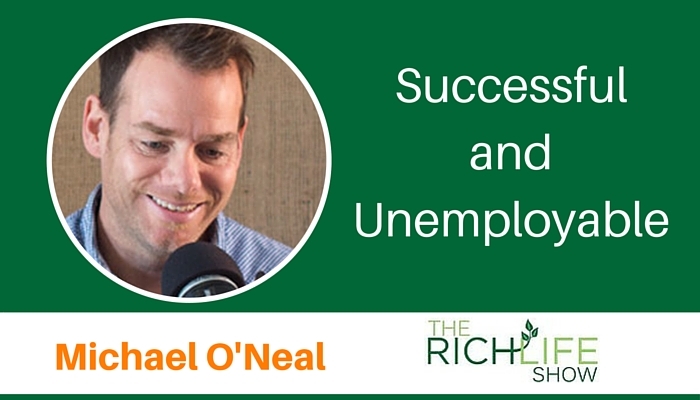 03:22 Michael O’Neal: Well, unemployable used to be a bad word. Right? Like “Oh God, this guy can’t get a job.” What happens is… I think that when you’re brought up in this very traditional way where you got to school and you get a job and you’ve had the job for a while and somewhere along the line, if you’ve found yourself being unfulfilled or feeling unhappy about it, that kind of plants the seed of like, “Is there anything else out there? Is there another way to do this?” And I think that if you continue to investigate that, and maybe start reading some of the books, like I read ‘Rich Dad Poor Dad’ and then I read ‘Cash Flow Quadrant’ and then I read ‘Four Hour Work Week’ and then ‘The E Myth Revisited’ and then ‘StrengthsFinder 2.0’ and all these books that really shifted my mindset on how I was supposed to be building a career. When I did that, at some point, they sunk in, and I went back to work. 04:17 Michael O’Neal: I was a creative director at a Fortune 500 company. I was a branding guy and a web guy and all this stuff. I was like, “Wait a sec, I don’t wanna come in here anymore and take these orders from this middle manager that doesn’t know a fraction of what I know, and doesn’t get it at all.” I found myself… I sort of swallowed the blue pill, and I was down the road of employability. I was so used to… I was a freelancer prior to working for this company. I was so used to having my own 100% time freedom. But now, when I was like, “Oh, I need to go visit my family.” Or, “I have a sick family member.” Or whatever, but I’ve got literally 14 days in a year that I’m allowed to go and sort of live my actual dream life. That’s not gonna work. 05:58 Michael O’Neal: The ability to have freedom to kind of just make the decisions and go, “Hey, you know what? I’m going to catch up on a few episodes of ‘The Blacklist’ now,” and it’s 11 o’clock in the afternoon, or in the morning. Like that to me is more important or go to the beach or whatever. That time freedom is, to me, worth six figures a year in and of itself. 06:19 Beau Henderson: Yeah, and that’s a lot of what we talk about here in this idea of living your definition of a rich life, Michael, because if we’re just working and sleepwalking through 10 decades of our life, wherefore, waiting to some destination maybe when we retire, we’re missing the journey. And those things you’re describing, the things you’re… Going down to Mexico, doing the car deal. All those things, it’s enjoying, it’s really making the most of the journey because that’s really where life happens. 06:50 Michael O’Neal: Living your life now instead of this mystical fantasy of like retirement. I’ll tell you the other thing is that you talked to most retired people, they’re bored out of their skull. 07:01 Beau Henderson: That’s true. 07:01 Michael O’Neal: They are bored, so why not do something that you love and then sort of never be retired? You just keep doing what you love until you don’t want to anymore and then do something else you love or not. You just do something you want to do. So I think, right now, we live in this time, there’s almost no reason to not start your own thing. Whatever that thing could be. You could be great at Excel spreadsheets and I could show you how to make six figures a year from Excel spreadsheets. Just that. And so there’s so many free tools out there and all the social media stuff and all of the inexpensive ways to build an audience like a Podcast or blogging or writing your own self-published book. There’s so many ways to take that knowledge you have in your brain that you’ve put together over the last 25 years and do something with it, into a real business, a real viable business. And when you look back three years down the road, you’ll go, “I can’t believe that I used to go to an office and I don’t even understand people that would do that now.” And that’s what happens. 08:02 Beau Henderson: Well, Michael, so a person out there listening, saying, “I’ve wanted to do that. I’ve kinda had this little dream, but there’s all these logistics and fear holding me back.” Is there some kind of a transition process you teach or cold turkey, what would you normally do or is it just case by case? 08:20 Michael O’Neal: Yeah, I think there’s definitely a transition because it’s scary. It’s a scary prospect for someone to be in a kind of the comfort of stability, to have that stability for awhile. And you find that a lot of people that are successful entrepreneurs got there because they were forced to be. 08:35 Michael O’Neal: It’s pretty rare that somebody was in this cushy six-figure gig and they liked it and then said, “Hey, I’m gonna go do something else” and they were poor for three years. 08:45 Michael O’Neal: What happens usually is they get laid off or there’s a death in the family or something tragic happens and they’re forced to buckle up and pick themselves up by their boot straps and go do something. So if that’s not the case, then what I like to do is, I have these episodes on my show called “Find your swing.” And what that means is for those of you who golf or ever swung a baseball bat or in my case a racquetball racket, despite how long you’ve been doing something, sometimes you’re not… Think about Tiger Woods. Top of his game a few years ago and now he has a hard time making the cut. And it’s only because he lost his swing right now. He’s had a lot of external stuff going on but from a mechanical standpoint, he’s lost his swing, so he needs to be coached to find his swing again. Once he finds that and is able to access that zone, he’s gonna crush it again if he does it ever. He may never do that, but it’s there. He could potentially do that. 10:52 Beau Henderson: That’s a nice exercise. I like that. 10:54 Michael O’Neal: That’s a good… Everyone practice that, any time you want. But what would you start talking about that you could just keep talking? Like what is that passion? And I had an example of that is I was at a conference called Social Media Marketing World and I was one of the speakers at it in San Diego earlier this year. And I had a guy that came up to me and had seen my thing on stage and said, “Hey, What do you think of my blog?” And I said, “Well, let’s talk about your blog.” And he told me about his blog, and I said, “How many people visit it?” And it was like 12 a day or something and he had like nine subscribers. I said, “How long have you been doing it?” He was like, “Year and a half.” And I was like, “Okay. What are you… ” And I go, “Come over here.” And we sat down on the barstool. I said, “Give me a couple shots of tequila.” He was a Spanish guy and we did a shot of tequila. I go, “What do you love dude? What do you love?” And he goes, “I love football, like soccer.” And he goes, “I love the strategy. I love the strategy behind it. I get so fascinated by how they… The plays they call and the personnel they put in and the strengths and weaknesses of them.” And he just started going and going and going. 12:27 Michael O’Neal: Thanks. Went over to Pat Flynn, “Hey Pat, what was your monetization strategy when you started Smart Passive Income?” He’s like, “I didn’t have a monetization. What are you talking about?” Okay. “Hey Amy, what was your… ” And nobody had monetization strategy, it was all about doing the thing that they loved because people will find you. 12:42 Michael O’Neal: I think the misconception is that, people have to have hundreds of thousands of followers to make any money. But I go, okay, well think of it like is this. If you’re a great Excel spreadsheeter, and I’m not but it’s the most boring thing I can think of. I try to use that as an example because it’s like, if someone can make six figures doing that, then you can do anything, right? So I say, okay if you’re great at Excel spreadsheets, think of it like this. You’re brand new out of college, you’re going to go to your first gig, it requires heavy lifting in Excel and you want to be great at it, right? You want to be awesome. 13:17 Michael O’Neal: Well, you are a master, you know all the formulas, and all the columns, and all the rows, and all the shortcuts, and all of the things, right? So what if you put together a little 10 part training course that was like a series of 10, 15 minute videos. That you recorded with your iPhone and you just wrote down the things that you needed. These are like 10 things every new Excel ninja needs to know or whatever it was and you sold it for $497. You did like a little webinar and you targeted it towards, kids that were coming out of college and getting into corporate America. 14:09 Beau Henderson: And it brings up something I think is key is, you’re very focused there. You’re very focused on… You’re looking for those 200 people out of millions, that are interested in that topic. That’s one of the things I see, too as we talk on the show. When somebody is very clear about who they’re helping, they do, they show up and find you. 14:31 Michael O’Neal: Yeah and it’s like… I mentioned earlier about going to this Porsche event, I’ve been a Porsche nerd since I was like 14. I finally got my first one in 2003 and then I got another one in 2005 and I restored it. So I have this car that I’ve restored, it took me 4 years and 2000 hours. I did everything myself except the final paint and I know everything about it. I know all of the nooks and crannies and I’m on all the message boards. I know all of the important people in the industry and all the big shops and things like that. 15:00 Michael O’Neal: A few months ago I said, you know, I should do something with this. I should go Rich Dad, Poor Dad on this and figure out a way to make this hobby, which is what it is, into something profitable. So I decided to do an app, an iOS app, that was for repairing and modifying air-cooled Porsche’s, air cooled 9-11’s and I’m calling it Rennch, that’s R-E-N-N-C-H. Which is Renn, like if you’ve ever heard of the Porsche RS or the Camaro RS, the RS stands for Renn sport, R-E-N-N sport. Which is [15:26] ____ race sport. So Renn is a very important word in the Porsche community. I named my app Rennch, R-E-N-N-C-H, and have already started recording the videos of it. 15:36 Michael O’Neal: And that’s a way that I’ve taken this thing that’s a hobby and I’m making it into, what I hope to be something that will be five figures a month of profit when it’s finished. And it will also really expand the brand and even though I have a show, I can’t turn my Solopreneur brain off. I still have ideas and things like that but what I’ll say to people is… I think a lot of successful people have massive ADD, like I do. And everyone has these great new ideas all the time and what I will say is, “Get one thing and boost it until it’s running on its own.” So it took me two years, a year and a half, two years, to get the Solopreneur Hour rocking. 16:15 Michael O’Neal: Now that it’s rocking I can then kind of have it systematized and I can kind of… I don’t want to say take my foot off the throttle but, I don’t have to be like completely dug in at all times because I know it now, like the back of my hand. Now I can look around and go, “Okay well I’m going to try this, and try this, and try this.” You know? 16:31 Beau Henderson: And it’s great content for the show, holy cow. 16:33 Michael O’Neal: It’s great content for the show… And by the way, the app could completely fail. Like, I fully expect to invest over $10,000 in the video production and in the production of the app and I could make $9 from it, but that’s okay. I did something I loved, I learned a bunch of lessons from it, it’s an investment in my career and in my life. But you know what? It might work, it might actually be awesome and it might open a lot of doors for me in ways that I’ve never even thought of. Maybe I’ll end up on Jay Leno’s Garage someday or Chris Harris on Cars or… You know what I mean? Or something… I hope to change the game in that way. 17:10 Michael O’Neal: But it’s those kinds of things and I’m just trying to get your listeners to understand it. You don’t have to be an online business person to make an online business. You just have to have a skill of some sort that you can either show people, or teach people, or demonstrate in some way, you can scale. 17:26 Beau Henderson: I think there’s a lot of resistance around this idea of leaving something that might seem safer or known. Of not really having, “Okay what if I try this and then I’ve hired the wrong person, I used to the wrong technology and I just spin my wheels.” So what do you say to that person, that really, what they need probably Michael, is a road map or just a step by step of, here’s step one, here step two because I know… I’m doing an analogy to Financial Planning. A lot of the problems I see out there are people had been instructed or have been working on level three and four things in their financial life before they took care of level one and two. 18:06 Michael O’Neal: Well, I never had any formal financial training ever, like ever and I found myself about a year ago, no 2013 about two years ago, I just got a big chunk of cash. It was the first real chunk that I’d had. It was a five… For me it was big, it was five figures something and I was like, quite honestly I had zero idea what to do with it. I’ve no idea what to do with that money. I’m just looking at it going “all right, I’m pretty sure if I keep it I’ll spend it, I need to do something with it” and then ultimately I invested a little bit in the business, a little bit in this. But eventually it went away ’cause I didn’t have a plan. I didn’t have a level one or level two, so I appreciate what you’re doing for people ’cause I think it’s really important and it’s a very under-served kind of industry. 18:56 Michael O’Neal: For those people that are in fear, what happened is I launched my show called the Solopreneur Hour and my hope for the show is I’ll talk to a lot of people that are in the same spot where you guys are in right now, which is like in that little fearful spot and then we talk about how they got through it and what they did and what moves they made and that helps them. That actually like “Oh okay, so here’s the steps I take.” But if I had to be really like trite the whole thing you get a coach it’s what you do. 19:45 Beau Henderson: Maybe I should look at it, yeah. 19:46 Michael O’Neal: Yeah, I’ll do that and now I have 80 people that are in my group coaching program that I help in very similar situations where they’re like in corporate America, they wanna figure out what their thing is, what their brand is and then grow it and figure out what tools to use and now that’s what I do. Mondays and Fridays I do coaching calls with people and I try to help them out that’s what I do. 20:05 Beau Henderson: It’s a beautiful model and the thing, I insert this quite often is I do believe in having coaches and team members for the different things you’re doing but if you’re gonna do something like this Solopreneur, you’re gonna make that jump work with somebody like Michael that has the track record that they’ve actually done it. The reason I say this Michael, is so many times I see people following people that they might be on the journey maybe but they haven’t actually done, but go work with somebody that’s already doing or has done what you aspire to do. I think that’s where you gonna find your real path. 20:47 Michael O’Neal: I think that’s very accurate. In fact I just saw Gary Vaynerchuk last weekend and he was talking about this onslaught of false coaches and people that were like 21 year-old life coaches I’m like oh really? You had a lot of life have you at 21? 21:01 Beau Henderson: All that experience. 21:02 Michael O’Neal: Yeah. You’re gonna really heavily navigate through whatever and so I think you have to do something, first of all you have to do something with integrity, whatever it is and I think if you’re in a service world, if you are like, “Hey I’ll help you be the best Excel spreadsheet person ever.” and you post that on Facebook a little bit and Twitter and Instagram and you get a few people that say, “Yeah will you help me?” You’re like “okay. Let’s do a couple of calls.” And you do a 30-minute call for $45 and you help them get set up. You do enough of those and you’re ready to go. “Okay I can actually do this now. I’m a de-facto expert in this and I could teach this.” I suppose you could study and then try to become a coach but I don’t know that coaching is for everybody, I think it you’re good at a skill you could do that too. 22:00 Beau Henderson: So you’ve given us actionable items that’s what I’m always looking to share here on The Rich Life Show. One, let’s get clear on maybe our skills and strengths and ‘StrengthsFinder’ by the way it’s up next to my stand, it’s been stack about 10 for a while but it’s on the next step. 22:16 Michael O’Neal: You got it. It’s a killer one. 22:17 Beau Henderson: I’ve been told I got to read that. So sorry, I digress, so you got to find that thing that might be your thing and then go and find the people that are interested in it too. ‘Cause I doubt you’re the only person in the world interested in that thing. And then the third thing that’s actionable is find a coach that could help you on that path that’s at least a step or two ahead of you. I think that’s good advice. So Mike, any other take aways that you would give for that listener that’s saying, because I hear it all the time any more true retirement when I’m having knows conversations, people want to do something part-time and a lot of cases actually have to because we’re living so long, they’re gonna have to generate some revenue somehow. 22:56 Michael O’Neal: I’ll do this for you, so I have a give away. 23:00 Michael O’Neal: You guys can get this if you want. You can text the word ‘solohour’ with your phone. You can pick up your phone, send a text message to 33444, just the numbers 33444 text the word ‘solohour’ and you’re gonna get a little thing back that says, “Hey, whatever blah, blah, blah.” Then you just put your email address in and it’ll send you this PDF and it’s called ‘The 8 3/4 steps to becoming a successful Solopreneur.’ I’ll give you just the titles now and just a little brief but the documents are much more in depth. 1] is discover your passion or the thing you love to talk about, that’s the thing that we talked about like on the stool like, what is it? You like flying kites? Do you like making models? Do you like football? Whatever it is. Believe it, it’s crazy to think but you can almost make a living out of anything at this point. There’s gonna be another few 100 people that are into it. 23:52 Michael O’Neal: You’re like “Yeah, I really like one-armed dentists from Arizona.” You’re like “Yeah, there’s a huge group for one-armed dentists.” 2] immerse yourself in the culture. Dive on in, which means, who’s in that world? Who’s who? Who are the leaders in that world, what are the top blogs or forums, where do you go to get the latest info? What websites are relevant? So dig yourself into the culture. 3] is seek knowledge. So the knowledge is… Consume. Consume everything you can about that topic. Books, threads on message boards, get a coach. This is the time to latch onto a coach and go, “Okay, I think I know what I wanna do now. Help me get this next step.” And then you… 4] and this is the biggest difference, is you have to make a decision to actually take action. I call it imperfect action, ’cause it’s okay if it’s not perfect. Most people just don’t do anything, that’s the big difference, is that people get warmed up, they get ready to get ready, right? They don’t actually go do anything. So you wanna take some action. 24:58 Michael O’Neal: 5] you wanna surround yourself with the leaders. So if there’s conferences that you can go to, if there’s periscopes or webinars or anything like that you can do to become… To make them aware of you. You wanna sort of do that. The one thing I love to do, this is the little hack for those of you that are trying to get in front of people that are a better influence on you, that they say, Jim Rohn said “We’re the sum of the five people we spend the most time with.” So if you don’t have any money, this is a great move. I did this… This was my move to open a lot of doors. If you are a hustler, like you can really… You know that you want to do something, there’s something bigger for you out there. And you wanna… Let’s say you are unemployable or maybe you are currently unemployed and you are working from home. Don’t just work from home. A, go to a coffee shop. Go to a co-working space. But don’t go to the coffee shop that’s nearest to your house. You go to the coffee shop that is in the wealthiest, fanciest part of your town and you work there. ‘Cause now you’re becoming surrounded by those people. 26:03 Michael O’Neal: When it becomes about 4:30 you roll over to the nicest hotel or the nicest bar in that little subdivision where you are, and you buy yourself a $9 or $11 dollar glass of happy hour wine, and you set your computer up on the counter on the bar, and you let happy hour develop around you. So by 6:30 the place is rocking, you’re sitting there working on your laptop, you’ve got a little buzz from your glass of wine. I don’t want you to think there’s a theme here, between the stool and wine. 26:32 Michael O’Neal: But you give yourself a little buzz with your glass of wine, and even if you’re a little distracted, it’s okay, ’cause what’s gonna happen, whether you realize it or not, is someone’s gonna walk up to you and go, “What are you working on, man? You’re in the middle of a happy hour, like what are you doing?” ‘Cause what happens is successful people recognize hustle, and they’re gonna go, “Wait a second.” Whether they’re super successful and they go, “Oh I recognize this guy’s hustling,” or they’re super successful and they go, “Dude, love the fact that this guy is just cranking out some work with a glass of wine in the middle of a happy hour. That’s a cool dude and I wanna work with him.” They’re gonna approach you and they’re gonna get your story and… I’m gonna assume you have a decent story in your… You’ve got something going on. And they’re gonna, “Hey, you wanna grab some dinner?” So I’ve ended up on golf courses, I’ve ended up on yachts, I’ve ended up on country clubs, to dinner at five star restaurants with people that I… And I had no money at all. 27:22 Michael O’Neal: “Come with us, come grab dinner with us.” ‘Cause, you make them laugh, you have a couple of stories, and say, “Oh, you know, I’m just working on this thing, I’m trying to get my hustle on so I can come here more often.” “Oh, really?” I’ll make them laugh, “Oh, come join us.” And all of a sudden you find yourself at dinner with the CEO of the bank, the local bank, and you’re like, “Wow.” And so that’s how doors get opened for you to do some cool stuff. So that’s what it means to surround yourself with the leaders. 27:48 Michael O’Neal: 6] is take more actions. Easy to get initial success and then stop, so you gotta keep cranking. And then 7] is show gratitude. When people are writing to you… ‘Cause you’re going to have… If you follow these steps you’re gonna be successful, and people are gonna be like, “Hey, I love your show,” or “I love this.” And make sure you respond to every single person and you engage with every single person and you don’t forget that two years ago you were them, and they’re looking up to you. 28:12 Michael O’Neal: And then 8] is give back. What can you do? Can you get on other people’s podcasts and can you share your knowledge? Can you write blog posts? Can you do a podcast? Can you share your knowledge with other people so that they can take a step in their life. Or financially. Can you give to charities? Whatever you like to do, whatever makes you feel better. Can you do that? And those were the eight steps. And then the 3/4th is just to have some fun. 28:34 Beau Henderson: Love it. Have some fun. Enjoy the journey. 28:37 Michael O’Neal: Yeah, it’s the fun part. I think that… You talk to Gary V. And he’ll say that if he gets the jets, he won’t be interested in owning the jets anymore. 28:46 Beau Henderson: That’s right. 28:48 Michael O’Neal: It’s all about the journey, for him, and for a lot of people. The hustle is the cool part. 28:53 Beau Henderson: So let’s remind people, so text ‘solohour’ to 33444? 29:00 Michael O’Neal: That’s correct, yeah. You can do that. You can also go to… I’ve a website. It’s really ‘solopreneurhour.com’ but you can just go to ‘solohour.com’ because no one can spell “preneur”. 29:12 Michael O’Neal: Can I plug the coaching thing too or [29:13] ____? 29:20 Michael O’Neal: Yeah, it used to be that I would say, “You know, let me know, I can… We’ll find out if I can help you.” Now I’m like, “I can definitely help you guys.” So it’s… My group is called ‘SoloLab’, because whenever I’m learning a new thing I consider myself in the lab, so it’s called ‘SoloLab’, and if you just go to ‘iwantsololab.com.’ ‘Iwantsololab.com.’ And it’s… I think it’s probably cheaper than it’s supposed to be. I have a lot of my contemporaries who’re like, “Dude, you need to charge more for that.” I’m like, “Ah, I like it where it is.” So yeah, come join us and we can hopefully help you get over… Not hopefully, we can definitely help you get over that like, “I don’t know what to do,” and “What am I going to do,” and “How do I do this? And I hate my boss”, so that’s what we try to do. 30:03 Beau Henderson: So yeah, any of those thoughts run through your mind? Go to the page, check out, ‘solohour.com.’ I’m excited to plug in, in the morning. I told Michael already. I said, “I haven’t seen a show in a while that I was this excited about to dig into,” because of the way he’s laying this out. And kudos to you, Michael for taking your experience, and turn it into something to help so many other people that are having the same experience. 30:29 Michael O’Neal: Thanks, man. I like to think my show is a good… I get a little Miyagi on my listeners. And here’s what I mean by that is that, I don’t promise when you listen to this show, I don’t go, “Yeah, here’s 10 steps for blah, blah, blah.” I don’t usually do that. That’s not how the show is. I bring people on and it will seemingly feel like we’re just talking about random stuff. And then hopefully, like a few days later, someone goes, “How do I do this? Oh, wait a second. A guy said he did this, this, and this.” I’m like, “Yes, that’s what we try to do.” Because I try to make it… For me, entertainment is first, and then I try to Trojan horse the value on you. 31:10 Beau Henderson: There you go. 31:11 Michael O’Neal: And what happens is… And I even have a… [chuckle] I even had an iTunes review the other day. Someone… He said, “The first time I listened to this, the ‘Solopreneur Hour’ podcast, I didn’t think much of it. I didn’t think I’d keep it on my playlist because I was too interested in finding podcast that filled every minute with action items and how-to information. Then a day or two went by, maybe a week before I started thinking more about what I heard. What turned me off initially, the casual conversations and stories is what brought me back. Since then, I’ve been hooked. And what I tried to… ” And there’s more to it, but it’s the thing where people just talk about what they did. And people remember the stories. When they remember the stories, they remember the content. If I just told them 10 things, they wouldn’t remember the content. 31:58 Beau Henderson: That’s right. 31:58 Michael O’Neal: So it’s a heavier… It’s a heavier road on… As you know, it’s a heavier lifting for the host. But I think it’s a longer term play or of listeners because now they can listen. Instead of having the same format of the show every time, now they can listen to the show, and never know what they’re gonna get. And they always are fascinated by what happens. 32:17 Beau Henderson: That’s, ‘solohour.com.’ If you can spell it, you go to, ‘solopreneurhour.com,’ but Michael made it easy. So thank you, my friend, and I hope you’ll come back, and share some more of the journey with us. Because you’ve definitely given us some things, and some things to think about, some valuable tools that can make… We make this transition, and some encouragement, and maybe even some inspiration for those of us interested in making this transition or one day living this… Or having this job that really fulfills us and lights us up. And maybe even as a side benefit, does some good in the world. You’ve made us all a little richer for sharing with us today, and I appreciate that. I hope you’ll come back. 32:58 Michael O’Neal: I would love to. And I’ll tell you what, if I can do it, anyone can do it, so don’t like… I’m the king of look-squirrel. So if I can pull it together for a couple of years now, then you guys can totally do it, no problem. Thank you so much for having me, though. It’s awesome. 33:12 Beau Henderson: Well, and let’s go full circle, so let’s go back to us getting spanked a lot as kids or punished is, you have taken some things that might have been just how we are early on. And you found a way to use them to your strength, and you’re making money, and you’re having fun. And that’s kind of what I wish for everybody. That seems like a rich life to me. 33:30 Michael O’Neal: I didn’t know it. I didn’t know it until someone stuck me on stage. And I was like, “Oh, okay. I kind of like showing off. This is fun.” And then, someone put a mic in front of me, and I think I had listened to Howard’s turn so much my whole life that all of a sudden I was like, this natural microphone, interviewer guy, and I was like, “Oh, that’s fascinating to me.” So you never know where it’s gonna come from. And I was psyched that I started the, “Solopreneur Hour,” when I was 42… 41 years old. So here we go. 34:00 Beau Henderson: Well, it wouldn’t be a show if I didn’t ask you one last thing. 34:02 Michael O’Neal: Hit it. 34:04 Beau Henderson: No limits, which I don’t see you having many any way from the things you’re doing. You’re on a trip, going by the Porsche show, and etcetera., etcetera. 34:14 Beau Henderson: Porsche, oh shoot, shoot. 34:15 Michael O’Neal: I know you’re from the South. 34:16 Michael O’Neal: But we gotta work on that. 34:17 Beau Henderson: Porsche, yeah. We’ll work on that. 34:19 Michael O’Neal: It’s a man’s name. Show some respect. 34:22 Beau Henderson: So what is your definition of a rich life? 34:26 Michael O’Neal: Oh, man. I feel very fortunate that I feel like I’m living it right now. And I say that, even though right this minute, like in these last couple of weeks, a few weeks, I’ve been in a very low point of it. And that’s a bummer. But it is what it is. But I know because of my experience, I know it will get better, and I know… And that’s the thing. I think a rich life for me right now, who I am is, being able to take the things I love, and bring the people along that I love with me. And say, “Hey, let’s go, let’s go do this.” And then, not have to worry about anything around it, scheduling or finances or fear. So that to me is what a rich life is. Michael O’Neal is a self-taught entrepreneur who has a passion for network marketing, branding, life-coaching, and internet marketing. He shares tips for how to start a successful company, and what you shouldn’t do as well on his podcast, The Solopreneur Hour – Job Security For The Unemployable. Michael started out as a web designer after receiving his communications degree from Temple University. He worked in that field for 15 years, even starting a company called Whirled Media. From there, he worked a few odd jobs but became unemployed in 2005 which was when he started his entrepreneurial journey. In 2007, Michael sadly lost both his parents and in 2009, he traveled to Europe as a way to mourn and heal. Following his return, Michael spent the next four years in network marketing, internet marketing, and life coaching. In 2013, he officially started his own podcast called The Solopreneur Hour – Job Security for the Unemployable.